A black and white negative of a lighting display in a window at W.A. Holliday's Hardware Store located at 113 Brock Street South in Whitby, Ontario. W.A. 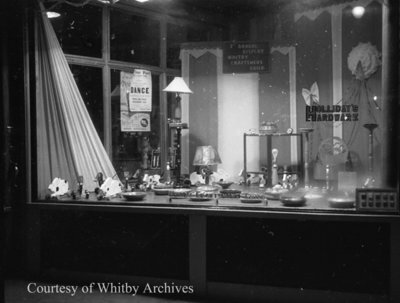 Holliday's Hardware Store Display Window, October 24, 1939, Marjorie Ruddy. Whitby Archives A2013_040_779A.